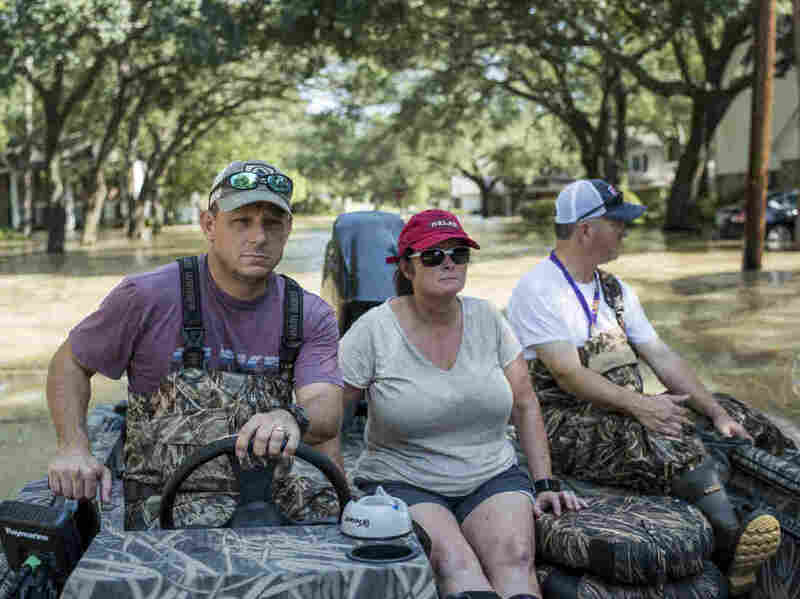 Harvey's Devastation Hits Home As Residents Return To Flooded Neighborhoods Volunteers in boats and personal watercraft are taking people to see their flood-damaged houses in Houston. For some, seeing their home for the first time is more emotional than they expected. 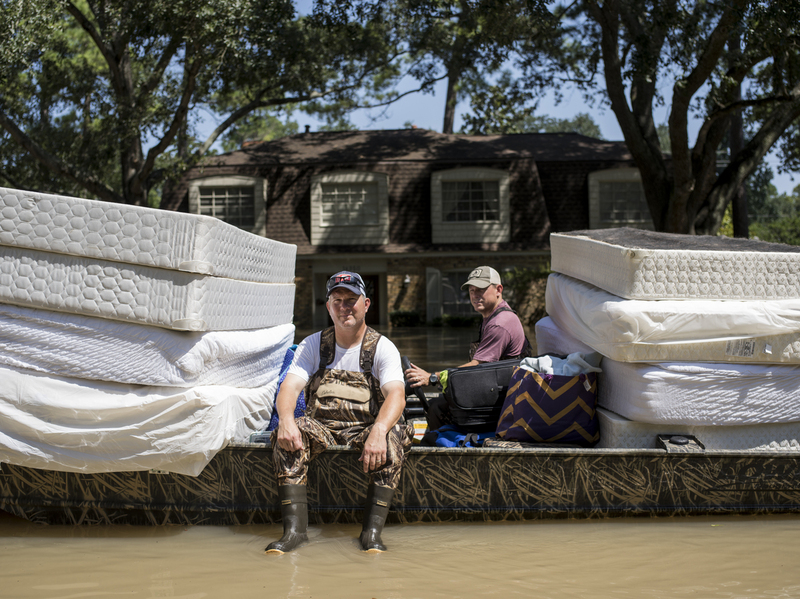 Scott McKnight (left) rides in a boat with his mattresses in the Nottingham Forrest subdivision of Houston on Thursday. 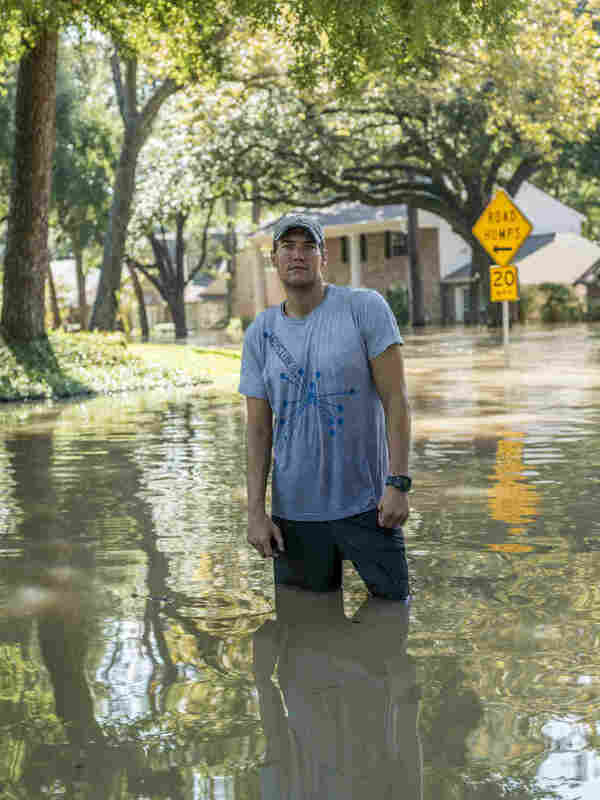 Bret Hinkie, a Houston-area commercial airline pilot and a high school friend of McKnight, is volunteering to drive residents to their homes in his boat. Flooding from Hurricane Harvey has been widespread across Houston, Texas, and surrounding areas. While the storm has dissipated, water remains in many homes. People are starting to return to the Nottingham Forest subdivision, an upscale area located just north of Buffalo Bayou, which has been heavily flooded. Homes that are closer to the bayou had anywhere from 2 to 5 feet of flooded water on Thursday. A lot of that flooding resulted from a controlled release of water from nearby reservoirs. Families are going back into the area to check on their homes, trying to salvage as much as possible. People are in kayaks and boats, but the water currents could be strong, almost to the point of needing a motor boat to navigate. Bret Hinkie, a Houston-area commercial airline pilot is driving boats for people in need. He gets calls from people all over Houston who want to be taken to their homes and then picked up after gathering their belongings. 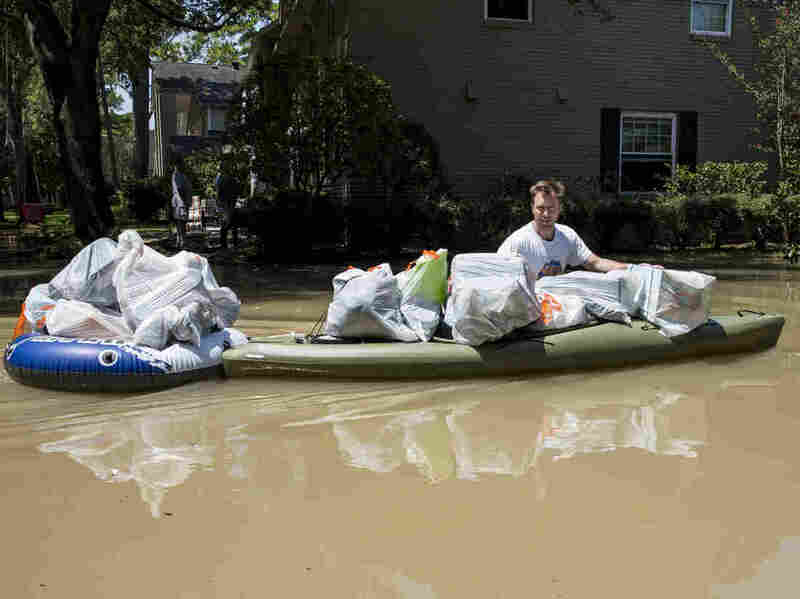 Hinkie takes the McKnights to their flooded home to get personal items. "What caught me by surprise was that I was bringing people to their homes for the first time," Hinkie said. "They finally see what they had known, but had not yet seen it with their own eyes." "What caught me by surprise was that I was bringing people to their homes for the first time," Hinkie said. "They finally see what they had known, but had not yet seen it with their own eyes. It really caught them by surprise emotionally ... That caught me off guard." Jared McCurley walks through the flooded streets near his home in the Nottingham Forrest subdivision. Hinkie said most people are looking for valuables and family heirlooms when they return home, fearing that looters may steal them. Others grab essentials such as bedding and clothing that are on a second floor and haven't been touched by the water, so they don't have to buy them again. Other items were more sentimental. "We had someone this morning who was related to Walt Disney. He [retrieved] a drawing of Alice in Wonderland signed by Walt Disney," Hinkie said. Hinkie had been working in other areas in the city earlier this week but ended up in Nottingham Forrest because his high school friend, Scott McKnight, asked for his help. The McKnight family, who was flooded out in New Orleans during Hurricane Katrina, has about almost 3 feet of water in their home. On the north side of Interstate 10 from Buffalo Bayou, a reservoir that runs along Barker Cypress road has flooded. Residents wait to get on boats or Jet Skis to be taken back to their homes to try to retrieve things or check the damage. 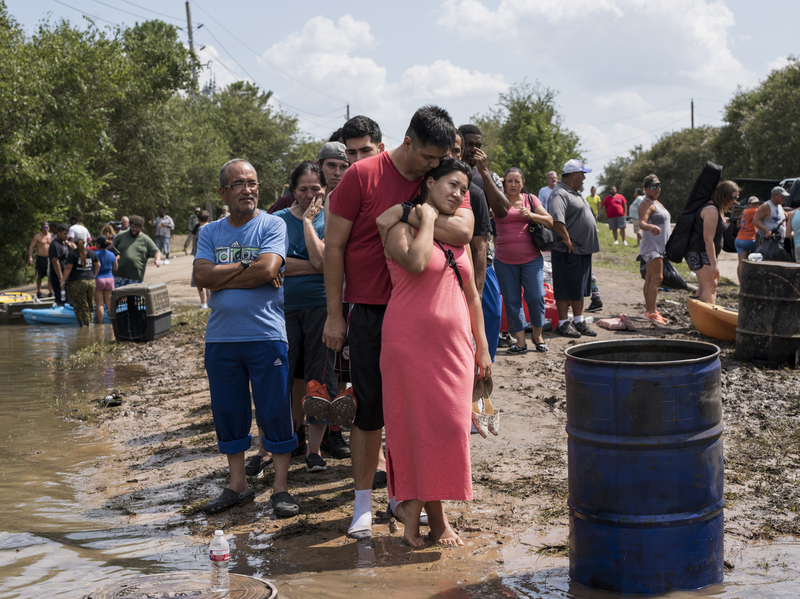 Ellie Nizamutdinova is comforted by her partner, Arnulfo Moreno, while they wait in line for a boat ride to check on their flooded home along Barker Cypress road on the west side of Houston. The Texas Department of State Health Services said Monday that water contamination from household chemicals and possibly industrial chemicals could be a problem. "Our best advice is always to avoid floodwater as much as you can," spokesman Chris Van Deusen said. "Of course, people have had to be in the water — they haven't had a choice." 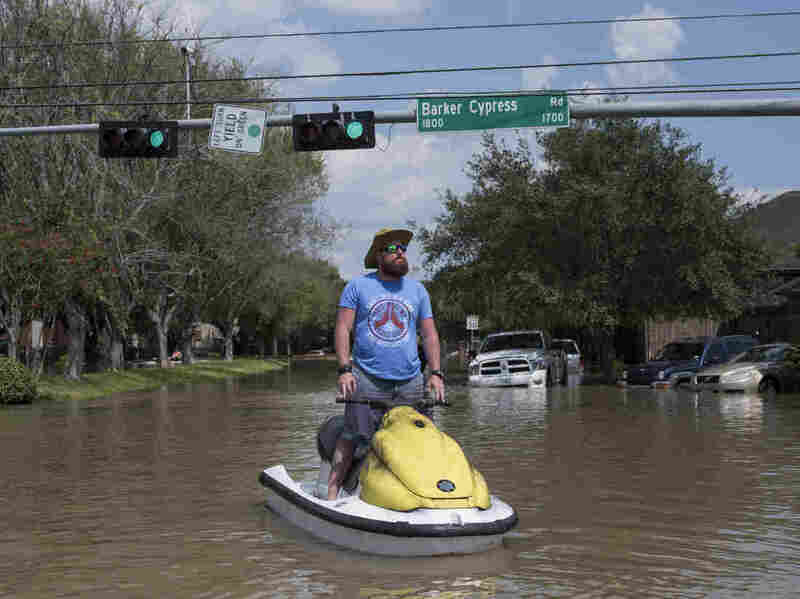 Rabon Raulerson stands on the personal watercraft he has been using to help flood victims on the west side of Houston check out their homes and salvage what they can. After checking in on their homes, even when the water was waist-deep, residents secured their doors. Some strapped locks on the outside to avoid looters. 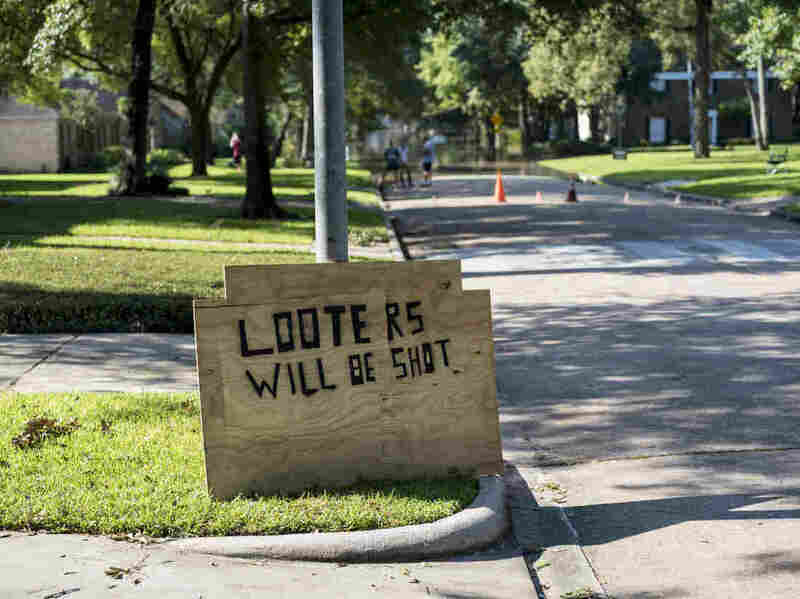 On Tuesday, as many as 14 people accused of looting had been arrested, according to Harris County District Attorney Kim Ogg. "We're a city that is about diversity and opportunity and all kinds of justice," Houston Police Chief Art Acevedo told reporters at a news conference Tuesday. "But we're not a city that's going to tolerate people victimizing people that are at the lowest point in their life." A sign warns against looting in the Nottingham Forrest subdivision. Local and state officials have vowed to crack down on anyone who victimizes the flood victims. 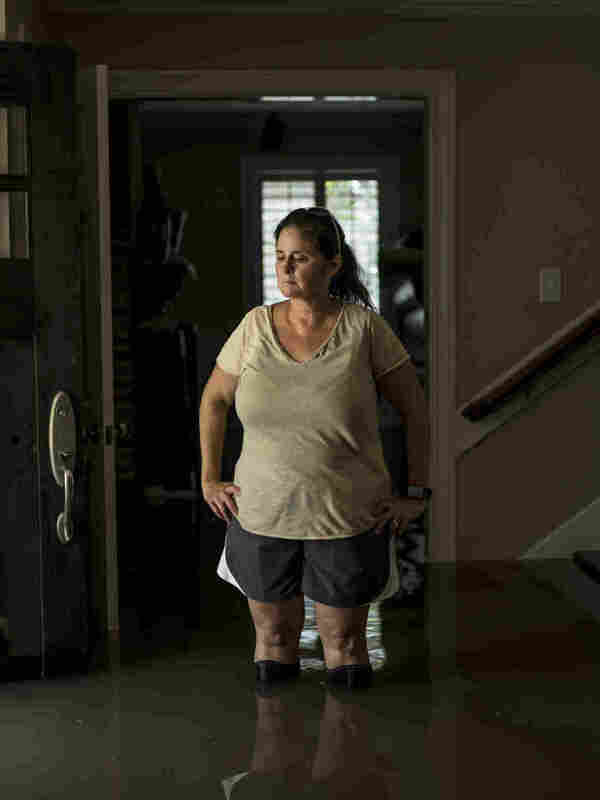 Houston-based photographer Scott Dalton contributed to this reporting.